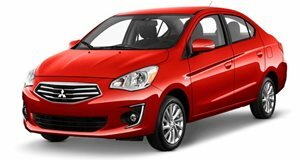 The 2018 Mitsubishi Mirage G4 is a front-wheel drive compact sedan powered by a 78hp, 74 lb-ft 1.2-liter 3-cylinder engine. A 5-speed manual or CVT automatic transmission are on offer. It offers mediocre interior quality and uninspiring handling dynamics combined with very poor acceleration. Standard equipment is acceptable although offers nothing unique in this segment. The Base ES trim includes a rearview camera and air-conditioner while the top SE trim level adds cruise control, heated front seats and an audio system with smartphone compatibility. New cars offer a certain allure over their used counterparts, better warranties and financing options can be big drawcards as can the knowledge that there are no previous owners or patchy service histories to worry about. The 2018 Mitsubishi Mirage G4 offers all of these points and one of the lowest prices around, although it falls short in a number of crucial areas when it comes to the actual driving experience. The Mirage G4 offers a cabin filled with hard plastics, average quality materials and poorly placed minor controls. This is not all that uncommon at this budget price level although the higher trim level makes little sense as it losses the value proposition without significantly enhancing the interior ambience. The front seats offer decent support and adjustment for most occupants, the rear seats are flat and do not offer much in the way of comfort, head and knee room is fine for shorter adults but they may not be so keen on an extended journey. The trunk offers adequate space although a small boot opening makes it tricky to load bulky items. The Mirage delivers a rather underwhelming driving experience, the suspension is at its best on smooth roads, everywhere else it transmits every bump and thump into a cabin that is already filled with engine and wind noise. Corners are best taken at sensible speeds and the steering is slow and less than precise. The Mirage is nervy on the highway where its skinny tires and tendency to wander in cross-winds make it less than relaxing to drive. Braking performance is good however and the Mirage G4 acquits itself well to city driving duties as long as you are not in too much of a hurry. The poor handling and cheap interior could be considered acceptable compromises at this price point if the Mirage managed to put in a good showing against the stopwatch. This is however not the case. Powered, for want of a better word, by a 78 horsepower 1.2-liter 3-cylinder engine, it also produces a wholly inadequate 74 lb-ft of torque. A 5-speed manual transmission is standard on the base model with a CVT standard on the top SE trim. Few cars are as slow to accelerate off the line as the G4, it struggles to get off the line, especially with the CVT transmission and 60mph eventually arrives after around 11.5-seconds. In-gear acceleration times border on the downright dangerous and overtaking with a full complement of passengers on board requires nerves of steel and a very long stretch of road. Needless to say, this places the Mirage at the bottom of the class and despite some excellent claimed consumption figures of 35/42 mpg in city/highway driving, you will be hard pressed to match them as your foot will be down to the floorboards in most driving situations. 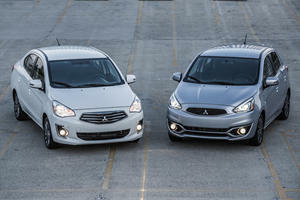 The Mirage G4 is available in base ES and top SE trim levels. The ES Trim include a 7.0-inch touch screen audio system with 4-speakers, rearview camera, steering-wheel controls, air-conditioning, rear heater ducts and tiny 14-inch steel wheels. SE Trim adds climate control, a smartphone compatible 6.5-inch audio system, updated keyless entry system, auto-dimming rearview mirror, fog lights and heated front seats. Optional extras are limited to some exterior detailing. LED daytime running lights, a center console and rear parking sensors. Despite a name that sounds like it could be some sort of fighter jet, the Mitsubishi Mirage G4 is a wholly underwhelming vehicle. It offers a very low list price, potentially great fuel economy and an excellent standard warranty although taking advantage of that last point would require you to keep it for a number of years, something you may not want to do considering the number of far more accomplished alternatives out there. 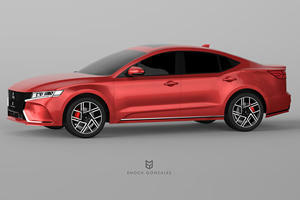 Given the sedan segment’s poor sales record these days, this slick rendering arrives too late.